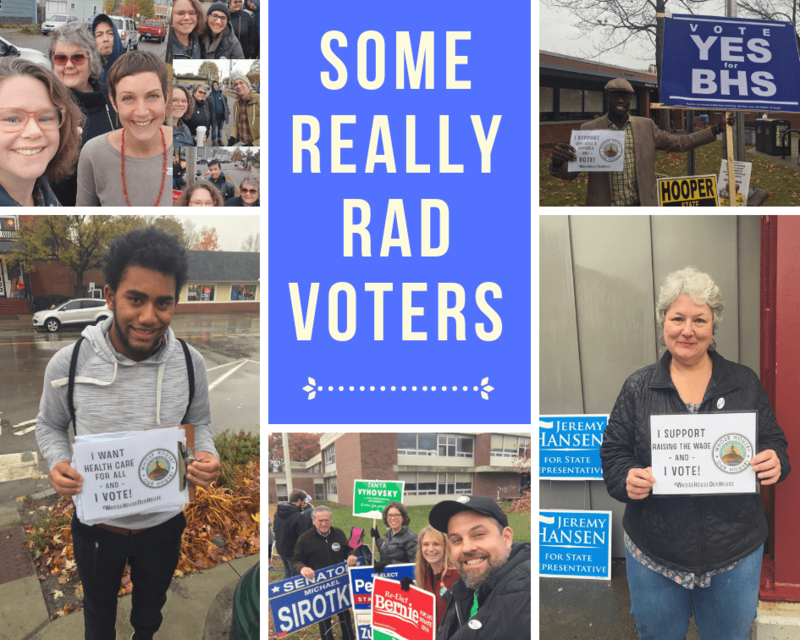 You helped Rights & Democracy (RAD) members and volunteers reach thousands of voters and create a record turnout for a midterm election in Vermont and re-elect some key leaders in the People’s House as well as build a veto-proof majority in the House. Winning a veto-proof majority in the House means that we’ve shifted the balance of power in our state from a pen back to the people. We have paved the way to pass bold legislation like a $15 an hour minimum wage, paid family and medical leave, tackling systemic racism, and taking real action on climate change—issues that already enjoy support by the majority of Vermonters. We have to thank all of the candidates who ran this election season and proudly carried RAD endorsement. We know that we’ll be seeing some of these candidates running again in 2020, as they built a strong base of support in this election. Gubernatorial candidate Christine Hallquist championed raising the minimum wage and paid family leave, among other top issues, as did our first-time candidates Tanya Vyhovsky, Kate Larose, Barb Wilson, Heather Stevenson, and many others. As an aside, RAD leader Mari Cordes didn’t win her first election in 2016, but she did this time around – ousting a longtime Republican and helped to secure a veto-proof majority in the Vermont House. These RAD candidates pledge to work with us—not stand against us—to raise the minimum wage, enact paid family leave, defend public education, tackle systemic racism, as well as protect our water, air, and move Vermont toward a real renewables future. We will be in touch soon about how you can keep the momentum going as we head into a very important legislative session, where we have plans to pass – again – measures that will improve the lives of our families and communities. We hope you’ll join us so that, together, we can make the change we want to see in the world. Take a bow. Take a breath. Let’s keep organizing! PS: Help us build a 365-day-a-year, member-led movement throughout Vermont by becoming a member today – either with an annual gift or monthly sustaining donation.